Sitting in the same position for hours on end may not be good for your body, but for those of us who work in an office, there hasn’t traditionally been much we can do to change that. There are expensive standing desks or ball chairs, but several workplaces won’t allow those changes, much less pay for them. Switching out your chair to one that isn’t a drastic change (that employers could claim are distractions) is possibly the safest way to make sure your body has a more ergonomic position during working hours. One of the newest ways to achieve that is a kneeling chair. When we say the kneeling chair is relatively new, we mean new. In fact, they didn’t even have these for sale until the 80’s. With that short a period of time, the market is still growing; you’ll be able to see that by the number of reviews for a lot of kneeling chairs. We reviewed dozens of kneeling chairs to identify the best of the best. We looked at kneeling chairs that roll and those that rock. We found those with the best adjustments and those that are going to keep your posture on point. No matter what your priority for your new kneeling chair, we have you covered. For a chair that will adjust to you and keep your neck, back, hips, and more lined in a proper posture, look no further than the DRAGONN Ergonomic Kneeling Chair. From nearly the beginning of our research for kneeling chairs, it was obvious that the DRAGONN Ergonomic Kneeling Chair had to be our top pick. With its ultra thick cushions and adjustable height, you’ll find this kneeling chair will fit your body just as it’s intended. The DRAGONN Ergonomic Kneeling Chair has an adjustable height that will allow you to kneel at the angle at which you’re most comfortable. And that’s good news for extreme heights on either end of the spectrum because your height won’t exclude this chair from being the right one for you. 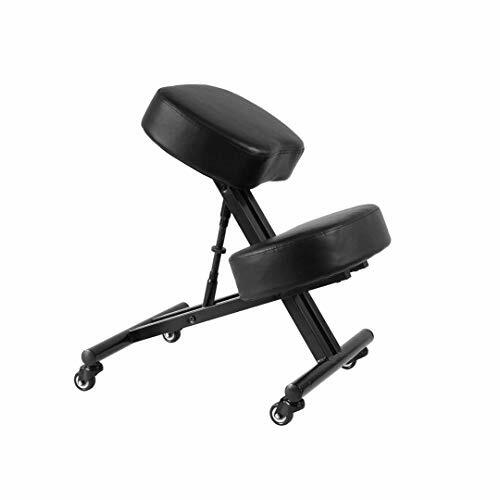 You can change the seat from 21″ to 28″ with just a turn of a screw adjuster. 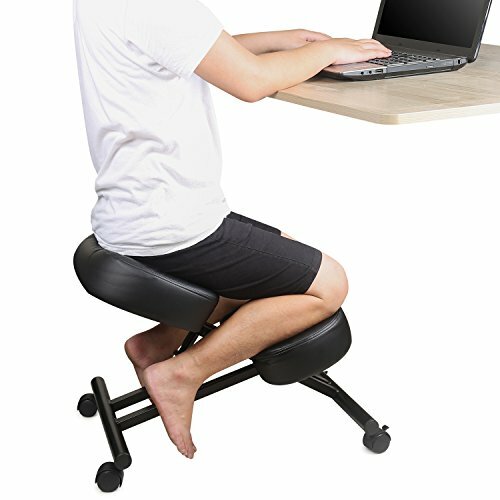 No matter the height adjustments you make, you’ll be sitting pretty in a chair that is a comfortable 90 degrees in relation to the knee pads, making your posture much more close to what is ergonomically healthy for your body. The knee and seat padding are both a luxurious three inch thick that will provide the most comfort for your body for short-term or all-day use. And, to make the transition from your old office chair all the easier, you’ll still be able to roll from one place in your office to another with the four rolling casters that will also lock in place when you’re settling in for the long haul at your desk. For a kneeling chair to have over 300 customer reviews is impressive enough but top that with its overall rating of 4.3 stars on Amazon and there’s no doubt you’re looking at the cream of the crop. Meet the SLEEKFORM Ergonomic Kneeling Chair and find the kneeling chair that will perform just as well with or without the wheels. 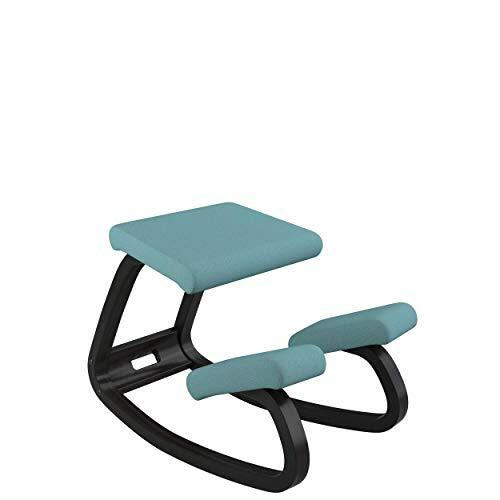 The SLEEKFORM Ergonomic Kneeling Chair will keep your posture in a healthy position and the cushion will have your knees and rear comfortable, as well. The composition of the thick padded seat and kneeling pads are half a recycled foam (so your environmentally conscious self can feel good about that) and the other half is memory foam (so you can get the support you need). The four caster rolling wheels are made of a very durable rubber material that won’t break down and can stand up to you rolling on carpet or hard flooring, either one. Unlike a lot of its competitors, this kneeling chair also will work just fine by removing those wheels. So if you want a stationary kneeling chair, this will work for that, as well. This kneeling chair has a slightly lower overall rating than our top pick, 4.0 on Amazon, but you will need to temper that with the fact that it also has over twice as many customer reviews on Amazon, over 600. While we think it may be just narrowly topped, it certainly is a very close second. For a kneeling chair that will keep the aches and pains of all day office sitting far away without breaking your budget, take a look at the Boss Office Products Ergonomic Kneeling Stool. 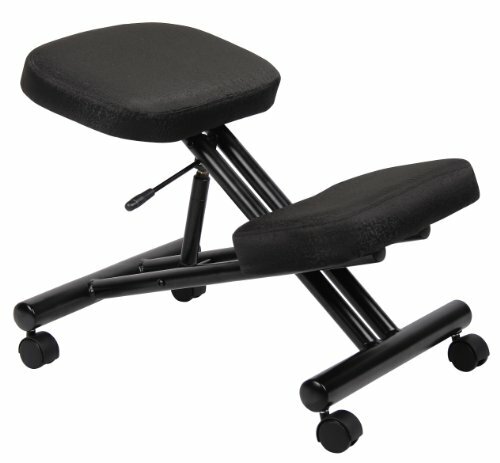 The Boss Office Products Ergonomic Kneeling Stool is adjusted with a pneumatic gas lift that will keep you from the complicated screwing and crawling under the seat. In fact, the adjustment is so gentle, you may even be able to do it without even getting up off the seat – and while holding your coffee! We may not be overwhelmed by the overall rating of this chair on Amazon, 3.8 stars with over 300 customer reviews, but we’re far from scared off by it. We’re even less concerned when we take in the overall investment which is well under $55. If you’re in the market for a chair that will be sure to keep your body at an optimal posture, you’ll want to check out the Office Star Ergonomically Designed Knee Chair. The Office Star Ergonomically Designed Knee Chair has a soft and supportive memory foam padded cushion in each of the knee pads and the seat, so you will be able to perch on this chair comfortably. The lack of a back will force your body to self-support and your posture to correct itself. The best practice for anything that requires you remain in one place for extended periods of time, like a desk, is to move around some. For a short break from the kneeling, you’ll easily be able to swing your legs around in front of the knee pads and sit atop this chair as a stool. While that’s not its intended purpose, nor is it the best ergonomic position, changing it up will help your overall comfort. The height of the seat adjusts with a screw design so that once you have your perfect position set, you won’t slip from it without intended to do so. The height adjustment range is from 21″ to 25″ and the maximum recommended weight capacity for this chair is 250 pounds, so this is an ideal chair for nearly all heights and weights. There are nearly 400 customer reviews on Amazon for this kneeling chair, with a respectable overall rating of 3.8 stars. And if that’s not enough to sway you, keep in mind that the price tag isn’t too painful, either; just $75 and this chair could be yours. For a chair that will let you rock while maintaining your best posture, pick up a Varier Variable Balans Original Kneeling Chair. The Varier Variable Balans Original Kneeling Chair still uses the original design created in 1979 and with good reason; it works! The chair doesn’t adjust, but it will allow you to maintain the same angle and posture that will maintain an ergonomically sound position for your body. The rocking capability will keep you moving and that in itself is a positive for your overall health but, more than that, you may end up seeing real results with a tightened core. We’re not saying you’ll have a six-pack by the end of the day, but you’ll be heading in a more fit direction than you would be just sitting in your old chair. Each component of this product is produced in Europe and manufactured with minimal waste. It’s made with the highest quality of wood and fabric to ensure its longevity and your comfort. There are no moving mechanisms, so you won’t need to worry about those breaking on you either. This rocking chair is certainly a luxury item with a price tag of nearly $400, but you get what you pay for and with an overall rating of 4.4 stars on Amazon, we’re inclined to agree this is a winner for your posture and overall health. If you have discomfort after sitting in one position for long periods of time, a kneeling chair may be able to help relieve you of that problem. Because the human body is simply not made to sit behind a desk eight (or more) hours a day, five days a week, there are bound to be some physical effects of doing so. Your back, shoulders, hips, and neck are just the most common places you can feel the effects of sitting in 90 degree angles for extended periods of time. If you’re suffering, then it’s time you try something new. A kneeling chair may be just what you need to help the aches and pains. We’ve also reviewed the best massage chairs in a separate post. You may see a dramatic benefit in your life, even if you aren’t yet experiencing any unpleasant side effects of sitting in the same seated position all day, every day. Because the position the kneeling chair forces your body into (i.e., a more ergonomic one), you’ll begin using muscles you don’t normally use, and that can really help your overall health and fitness. If you’re unsure how much you will really notice the change, take a few minutes to kneel and then lean back slightly until you feel your core tighten. This is a dramatic incline that you won’t feel every day, but it uses the same muscles that you’ll be using in a kneeling chair – even if in a much slower, gentle way. Backed kneeling chairs. A kneeling chair that comes with a back has its own pros and cons. The biggest of each is the same; The back functions as a safety net of sorts. If used properly, a kneeling chair does not need or use a back. A back on a kneeling chair is like training wheels; but worse. It’s not what the kneeling chair is intended for and while it’s a nice relaxing break from your proper posture to just lean back and exhale a bit, you have to be careful you’re not overusing that back. Otherwise the entire point of the kneeling chair is wasted. Backless kneeling chairs. The vast majority of kneeling chairs will come sans backrest. 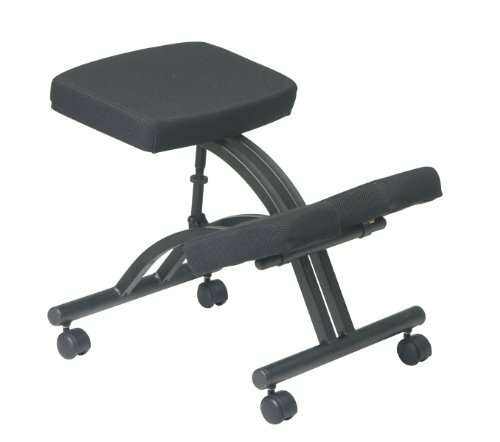 You’ll find that without the crutch of that backrest, your body will do some amazing posture correction all on its own. Your back will force itself into an upright position for most of the day without any extra effort on your part. If you find yourself hunching over time, you may need to re-position the height or you can take that as your cue to move around a bit. You can stand up and stretch or pull your legs out from the kneeling pads for a moment and then put them back to “re” obtain a comfortable position. But that is your best indicator that your body needs a change; even for just a moment. We’re not meant to sit still for 8 hours straight every day! Rocking. A rocking kneeling chair is doubly beneficial in that it will keep your posture just as it should be which can prevent your aches and pains, sure. But it will also help you become more fit in your day-to-day. Rocking on your knees like these chairs require you to do is a workout, even if small. After a while of doing this all day every day, you’ll very likely see some differences in your body. The more you use your stomach muscles, the stronger they will become and the kneeling rocker will definitely use them. The beauty of it, though, is that you probably won’t even notice you’re doing it. It isn’t a workout routine that is going to get you fast results, don’t get us wrong, and you may not really ever see physical results. But any healthy movement is good for you and if that means we can have the extra cookie without packing on the pounds, we’re all for it. Leather, pleather, or fabric. The material with which your kneeling chair is made is a big factor in the quality and longevity of the chair. There aren’t that many moving parts in even the most complicated kneeling chairs and because of this, you’ll find the few components there are definitely need to be top quality. The fabric has to be thick and hearty, the pleather needs to be thick and tightly woven and the leather needs to be a high quality production. Obviously, it won’t be cost efficient to get a quarter inch thick buffalo leather kneeling chair. But you will want to look through some reviews on whatever you decide to go with to make sure the fabric isn’t going to fall apart on you. Memory foam. There aren’t too many other ways to cover the big takeaway from the type of foam your kneeling chair has: Memory foam is comfortable. It supports your body, while letting you sink in a bit and still maintains its shape when you get up at the end of the day. What is a kneeling chair? A kneeling chair is a stool that probably doesn’t have a back (although it can) and will have a place for you to rest your knees and shins. The seat will be tilted at an incline so that your weight can be partially distributed to the knee pads and your back will naturally fall into an ergonomic position optimizing your body’s posture. The incline can change depending on your preferences and your height and the material and quality will vary, as with any product, but the overall scope of the kneeling chair is to kneel at a sloping angle rather than sit with your body at all right angles. Kneeling chairs are especially helpful for those of us with back pain because they encourage (and sometimes force) us into a proper upright posture. By taking the pressure off some parts of your back, your neck, shoulders, and hips will align properly and quite possibly relieve some of your body’s pains. Sitting with your knees on a pad in front of you will force your legs open and place your hips at a more natural position. If you work at a drafting desk that is inclined, a kneeling chair is all the better because it makes reaching forward quite a bit easier. As long as you place your work directly in front of you to prevent any pinching of nerves or “tweaking” your back, then this position could relieve a lot of the pain that you’ve previously just learned to accept. The additional bonus for using a kneeling chair is that you use different muscles in order to sit in one, namely your abdominal muscles. If you struggle working those muscles or you want to firm them up, a kneeling chair could help you with that as well. (But this definitely does not replace a healthy fitness routine and will not give you miracles.) It may even be able to help with pinched nerves, orthopedic problems, scoliosis, tailbone pain, lowered blood circulation and more. How do you sit in a kneeling chair? If we were to give a simple answer to how you are supposed to sit in a kneeling chair we’d have to say, “at an angle.” When it comes to the position you need, you’ll want to look for a seat that is sloped at approximately 25 degrees. That angle isn’t always easy to find so you may just want to find the one that is the closest. In fact, most chairs won’t even give you the degree of slope that you’ll be in, but the degree that the seat will be in relation to the knee pads. And most of the time, that will be around 90 degrees. You’ll place your bottom on the seat, inclined and the place your knees on the knee pads below and in front of the seat, allowing your knees to bear some of your body’s weight. If there are two separate pads, then placing your knees is easy, but if it’s a longer bench-style knee rest, you’ll need to make sure your legs are spread naturally for optimal positioning of your hips. You’ll need to remove your knees from behind the knee pads before you stand up and will need to sit before you place your knees onto the pads. How do you adjust a kneeling chair? Each kneeling chair is different just like each “regular” chair is different. They will all come with similar adjustment devices but they won’t all be exactly the same. For the most part, you’re looking at just the one place to adjust (possibly two if your chair has a back). You’ll likely just be able to adjust the seat’s height (and possibly the angle along with it) much the same as you would a standard office chair. You’ll sometimes find the adjustment is the hydraulic style, but more often than not, it’s a more simplistic screw/unscrew, heighten/lower process just under the seat. The knee pads may adjust the same way, or they may remain stationary and the only place you can adjust is the seat. Swivel seats will be less likely to have as many adjustments because you’ll be able to adjust yourself from moment to moment; but don’t look too hard for these – they’re pretty rare. We looked at 20 other kneeling chairs. Even though they didn’t make our 5 best kneeling chairs list, they’re the best of the rest and each is still a great option for you. The information you’ll need to compare each one is included with the listing. The blend of foam types makes this seat a comfortable and supportive one. This kneeling chair will function in whatever capacity you want it to, kneeling or sitting with a back – your choice. The reclining back on this kneeling chair will give you an extra level of comfort: you can recline to a nearly lying position! This backed kneeling chair will allow you to support your body’s weight with, primarily, your leg muscles rather than your back. This backed kneeling chair is finished with a powder coating and is stationary so you’ll stay perched safely atop. You can easily adjust the height of this kneeling chair by simply twisting the bar beneath the seat. This kneeling chair features four castor rolling wheels with brakes so you’ll be able to move freely and stay stable when you want to stay put. You’ll be able to adjust this kneeling chair while sitting on it with the gentle pneumatic height adjustment. This kneeling chair has an adjustable height from 21 inches to 29 inches, making it useful for nearly everyone. With 360 degree movement on each of its dual wheeled, locking casters, you can move freely in this chair. You can adjust this kneeling chair to three heights from 21 inches to 28 inches, making it a nearly universal fit. This lightweight kneeling chair is easy to lift and move around; it’s only 14 lbs. You can rock this chair and build up your core muscles with ease. This seat will adjust manually by lifting the wooden rod under the seat to one of the three height adjustments. This kneeling chair has a 250 pound weight capacity, giving it an excellent range of possible consumer. This kneeling chair uses quality wood and fabric construction. The height of this kneeling chair is adjustable to one of its three preset heights. Once installed, your knee pad won’t go anywhere, but during installation you’ll be able to choose from 5 positions to fit you perfectly. If you’re in the market for a chair that will keep you in an ergonomic position, you may want to also consider a desk that inclines to prevent you looking down all day. We have tried not to underestimate our readers capability to get into and out of these chairs gracefully, but if you struggle with coordination or balance (like we do), you’re going to appreciate the handles on this kneeling chair. Jenny is a frequent contributing author for Family Living Today. She's originally from Central Ohio but has lived all over the world with her family, including Texas, Florida and Germany, among other places. She's taken her three children (and fur babies, too) with her along the way and currently calls Eastern PA home. She's been a wife for 15 years and a mother for 8 years. She has three children who have taught her so much more than just facts and numbers and has researched all things family and home out of necessity and fun. She's used that expertise to write all things family since 2011.